Sometimes it just gets out of hand. Other times it might be that a property has been tenanted for a few years and not maintained. Whatever the reason, we clean up Brisbane yards like no-one else. Being an arboricutural business at heart, we can take care of cutting back trees better than any handymen. That’s usually important, firstly because you don’t want unskilled workers taking on tree pruning. Secondly, overgrown trees really do make a property look messy, even causing more problems such as damaging gutters, affecting the lawn and making the clothesline dysfunctional. Properties that haven’t been maintained usually have tree weed species. It’s a function of overgrowth that it allows invasive trees to flourish because they prosper where cultivated varieties cannot. It is bad for both the environment and your property value, and they just keep growing. We don’t consider ourselves above getting our hands dirty, either. 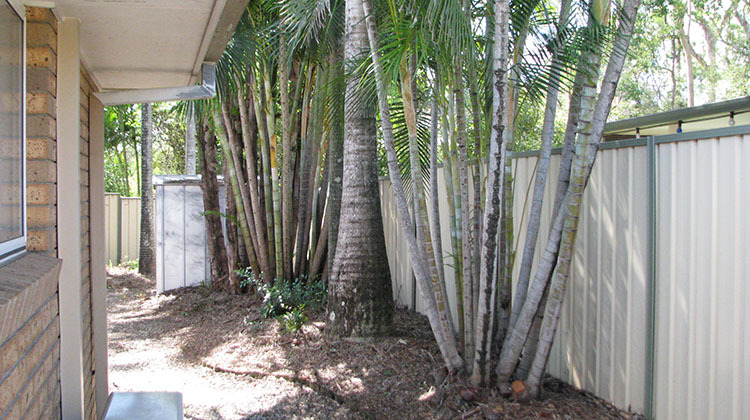 An unkempt yard often has green waste piles, overgrown grass (usually with weeds) and various metal objects. We expect it all, and deal with it accordingly. Real Estate agencies and landlords are given speedy attention, too. Firstly with a firm, written quote, then with completing the work in-between tenancies. We’re happy to fit it with your schedule. If that sounds like a welcome change from tradies that expect you to fit in with them, give us a call. You’ll be wrapped. This is Mary’s property at Calamvale. She’s been flat out taking care of her Dad. We took care of her yard. 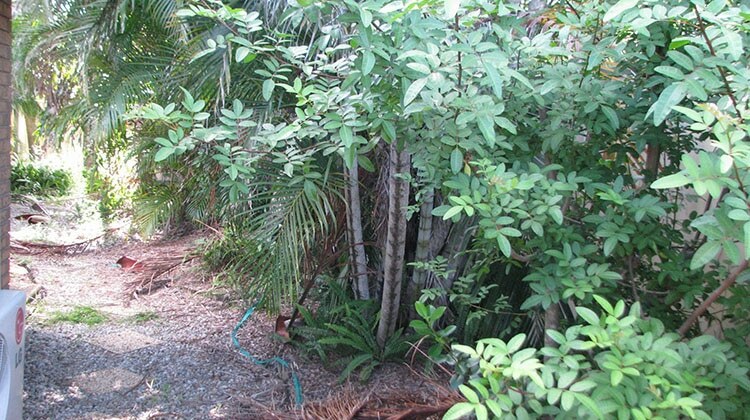 This is a photo of the same area after we removed the Pepperina, a weed from South America; removed all the expired palm fronds from the ground and those still hanging onto the trees; and climbed and removed the Golden Cane stalks too close to her home. We cleaned up the rest of her property, too. 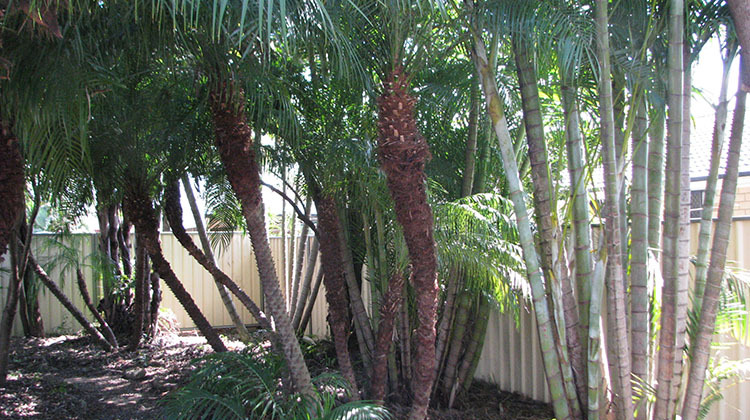 The back yard had a lot of Palm trees. Mary didn’t want them removed, they are all beautiful trees. 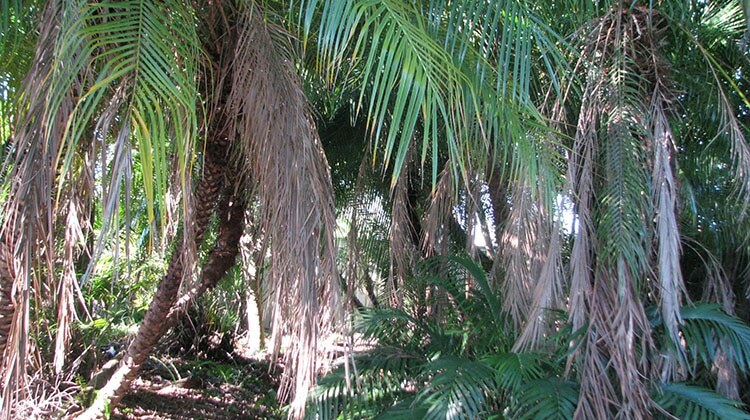 It was just a matter of removing the dead fronds, a lot of which hang onto the palm’s crown shafts; trimming outside stalks of the Golden Cane fronds and Fishtail palms; and cleaning up the green waste from the ground.